By now, we’re all used to witnessing fashion trends that toe a fine line between brilliant and idiotic. We’re all used to discovering our next ‘must have’ piece on the catwalk, only to be told 37 seconds later by the Mail Online that it is, in fact, “laughable”. Ugly trainers, severed heads, orthopaedic shoes, impractically small sunglasses, heck, we even caught the Queen sitting front row last week, looking lustfully at one of Richard Quinn’s floral gimp masks. Next up? Plastic bags. So. Hot. Right. Now. Once just commonplace, they’re now more subversive (and expensive) than anybody could have anticipated. Where did this trend come from? Well, like most of the trends that have left us shook these days, it seems Raf Simons was the originator. For his spring/summer 11 at Jil Sander, he unveiled a goldfish-orange acetate shopping bag that customers went wild for. Retailing at a cool $135 (steep for a shopper, but not so bad for a Raf-designed piece) the piece sold out almost instantly, with bloggers and fashion sites dubbing it the “Anti-It Bag”. In an era when the fashion dream was to own an Hermès Birkin or a Fendi baguette, Raf challenged the idea of what a desirable handbag looked like, democratising it ever so slightly, and causing a heated conversation in the process. Many loved it, but the acetate bag unsurprisingly became the subject of scrutiny from those observing the fashion world from afar. In retrospect though, it’s just further proof that Raf has always been ahead of his time. "In an era when the fashion dream was to own an Hermès Birkin or a Fendi baguette, Raf challenged the idea of what a desirable handbag looked like, democratising it ever so slightly, and causing a heated conversation in the process." While the style has popped up on the runway a couple of times since then (sequined and bearing twisted supermarket logos courtesy of Ashish for spring/summer 14 was a particular highlight) we’ve been waiting for the world’s most ubiquitous fashion accessory to have its runway renaissance. As this year’s trends rolled around, we finally got it. Courtesy of Phoebe Philo, a clear shopper bearing the Céline logo hit shops with a flurry of outraged tweeters and tabloids lambasting its $590 price tag. Then there was the clash of outrage and astonishment as Demna Gvasalia bowed his for Balenciaga: lambskin shoppers -- a little sturdier than the 5p plastic versions -- that paid homage to the kitsch aesthetic of German supermarkets. One tote bearing the brand’s ‘Double B’ logo, fashioned to resemble Germany’s favourite grocery store Edeka, retails at $1150, and has sold out during its pre-order stage already. And who could forget his souped up satire of the ikonic Ikea bag? Then take a look at Burberry's incarnation from their February show -- latex-like shoppers in pastel yellows and baby blues -- aren’t available to buy in stores. Instead, Christopher Bailey’s take on the trend sees them serving their original purpose: as shopping bags for anybody who buys a piece from his swansong collection. 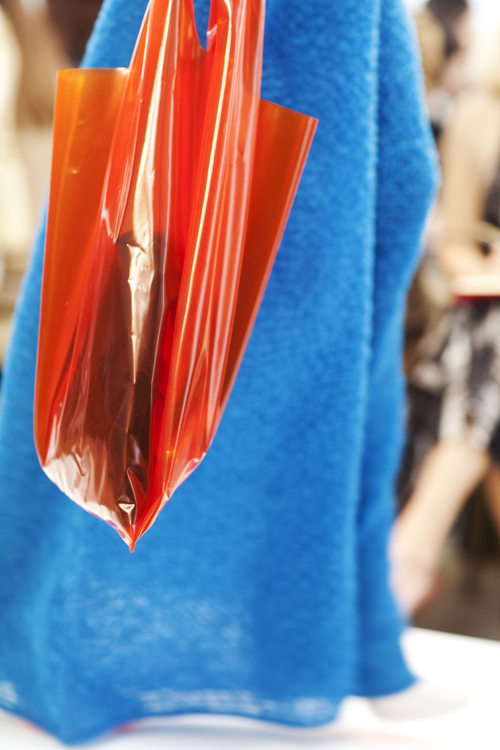 Oh, and just this week, LVMH prize winner Marine Serre unveiled her version at Paris Fashion Week: a sweet-wrapper red plastic bag that will carry the trend through to autumn, too. These homages to the humble shopping bag seem to be everywhere, but we shouldn’t be surprised. With Demna Gvasalia at the forefront, we’re still in an era of the elevated prosaic; it’s ironic normcore and nothing is sacred. Humble T-shirts, hoodies and jeans have become the statement centrepieces of many designers’ collections. Flaunting wealth in such a boring and obvious way is no longer cool, designers are now borrowing everyday tropes from the streets and reselling it as luxury. The irony being you still have to be wealthy in order to participate. Perhaps these luxury, long-lasting versions of the plastic bag are ecological statements first, and fashion statements second? In an industry built on the idea of lavishness and excess, the concept of being environmentally ‘woke’ is for many brands an afterthought. But alongside his brother Guram, Demna Gvasalia has conveyed that his ‘high demand, short supply’ business model with Vetements is as much a statement on the fashion industry’s overproduction leading to waste, as it is a smart strategy to increase his brand’s value. Last year, the waste charity WRAP discovered that clothing was the fourth worst offender in the UK for producing CO2 emissions, in part due to our obsession with buying too cheap rubbish rather than opting for investment pieces. Look at the plastic bag trend through that lens: every year we plough through one trillion of them, and the vast majority are thrown out after being used once. You wouldn’t be caught dead binning your Céline shopper, would you? "Every year we plough through one trillion of them, and the vast majority are thrown out after being used once. You wouldn’t be caught dead binning your Céline shopper, would you?" If you think these timely, expensive purchases are an example of us worshipping at the altar of fast fashion trends, consider this: we’re seeing contemporary designer’s past collections being treated like antiques now: stored in museums or auctioned off for eye-watering amounts of cash. For example, a cape from Raf Simons’ autumn/winter 01 Riot! Riot! Riot! collection could set you back anywhere up to $10,000 now -- a serious increase in price, built on the fact that that season is considered one of his most visionary. We’re told to buy less and to buy pieces that last longer. While a plastic bag might not have the versatility of its more expensive Hermès sister, it does stick in our memories and become one of those hallmark pieces of Philo-era Céline, or Demna’s Balenciaga. 10 years down the line, you might find that once irresponsible purchase being worth far more than what you paid for it. The times we live in – full of political, social and environmental conflict – are reflected in the work we see on the runway. So what’s more absurd -- the fact that a $600 plastic bag has made it to the shelves of Nordstrom, or that we manage to consume over a million a minute of its low-cost counterpart? Next time you’re down the off-license grabbing a last minute bottle of wine and an aero before a Tuesday night in home alone, save the kitsch stripey bag! Next thing you know, you might be tipping the contents of your leather purse into it while the taxi waits outside.